The Keystone Archaeological Preserve is located on the lower floodplain of the Rio Grande with wetlands immediately to the north and west and the Keystone Dam immediately to the east, in northwest El Paso, Texas. The site was first discovered in the 1970s during an investigation of the area prior to the construction of Keystone Dam which was intended to provide flood control on one of the larger arroyos from the Franklin Mountains to the Rio Grande. Following the site’s initial discovery, the University of Texas at El Paso’s (UTEP) Centennial Museum conducted a testing project to determine the significance of the site. In 1979, Thomas C. O’Laughlin excavated portions of Site 33 for the purpose of mitigating the effects of dam construction and prepared a report in 1980 for the Army Corps of Engineers. 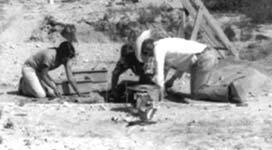 An excavation was conducted by members of the El Paso Archaeological Society in 1984, but this excavation was on a portion of the site which is now outside of the The Archaeological Conservancy’s (TAC) and City of El Paso’s portions of the site. Research revealed the presence of both Middle Archaic and Late Prehistoric (El Paso and Mesilla Phase) occupations of twenty-three (possibly 41) brush huts; basin-shaped shallow floors and fragmentary chunks of clay, some with impressions of vegetation were found dating to about 2400BC-1800BC. Three were fully excavated. Along with the brush huts, excavators found domestic hearths, roasting pits, and a large trash midden, along with chipped stone, ground stone, utilitarian pottery sherds and numerous scatters of fire-cracked rock that date to the later Late Prehistoric Period (200AD-1450AD). The Keystone site is important as one of the oldest known village site in the western U.S. and perhaps the largest site containing Archaic period houses in the western U.S. or northern Mexico. The site may be unique in its ability to inform us about the major behavioral changes that occurred during Archaic times, when humans in the Southwest first changed from mobile hunter-gatherers to more sedentary reliance on cultivated plants, harvesting wild crops and utilizing the wetland food sources. Excavations to date have not determined differences in site usage between the Archaic and Late Prehistoric phases. The Keystone archaeological site, 33(41EP494), consists of a five-acre portion owned by the City of El Paso (EP) and a four-acre portion donated by developer Chris Cummings to The Archaeological Conservancy (TAC) in January 1999. Both the TAC and City portions of the site are located within a 52-acre tract of land known as Keystone Heritage Park. The 52-acre park in El Paso’s upper valley is a City-owned property leased to Keystone Heritage Park, a non-profit organization charged with preserving and developing the park. Oversight of the archaeology rests with the El Paso Museum of Archaeology, Museums and Cultural Affairs Department, City of El Paso. The tract was originally privately owned by several families, who compacted the property and sold and/or traded the land to the railroad and the City of El Paso. In 1983, the Texas Historical Commission designated the Keystone site a State Archeological Landmark (SAL) under the Antiquities Code of Texas. State officials also determined the site’s eligibility for listing on the National Register of Historic Places. It was decided by TAC, the Texas Historical Commission, the City of El Paso and the predecessor of KHP at the 2000 Keystone Archaeological Preserve management meeting that both portions of the site would be included in that management plan, and that concurrence also applies to this revision of the management plan. However, each party to the site management plan will retain exclusive authority to decide matters that apply only to their portion of the site. At some point in the future, TAC, the City and KHP may explore the possibility of signing a lease providing for the management of the TAC portion of the Preserve by KHP. Such a lease would require KHP to keep appropriate insurance to indemnify TAC against damages. This cultural resource management plan ensures that any future investigations within the Keystone Archaeological Preserve will be conducted according to the highest standards of problem-oriented, scientific research, in accordance with the Secretary of the Interior’s Standards and Guidelines for Archaeology and Historic Preservation, and in consultation with the Texas Historical Commission. The plan also ensures that the preserve will be protected for future generations to enjoy. The plan addresses site security, access, erosion control, groundcover, and artifact curation. The plan is not designed to require a consensus of the participants.